Soooo.... you have probably noticed that I don't do a lot of bottoms. Part of the reason is that I think they're harder to fit than tops (Pants, that is. Skirts are usually fine). Also, I'm avoiding the fly front. Lame, I know! I'm just content in my little world of blouses & dresses. 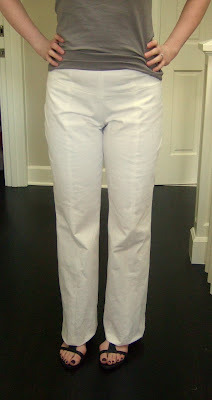 Ivory cotton twill with lycra. All of these long, long seams made me yearn for a serger for quick and easy finishing! I've been looking. I'm trying to find a good deal on a used machine. My sewing machine has a faux overcast stitch that will suffice until then. I didn't make any alterations except for some fine tuning in the waistband area. Easy project. I'm feeling pretty "eh" about the pants, but they'll serve their purpose. I promise I will make a fly front on one of my bottoms included in the wardrobe contest. I'm finding that the more you read about how to do it, the less scary it seems. They look great from the front! They do indeed look great, I shall have to dig out that pattern, the CF & CB seams make pants much easier to fit I think. I'm in the same boat as you, all I have made lately are tops! You can totally do it! I'm rooting for you! Yeah, go ahead, try fly front!!! The pants look great. I am going to add my encouragement for fly fronts. Between Debbie C's great tutorial and Sandra Betzina's instructions in her book. You can do it! Those look really great on you! And yes, do try a flat front, if you use Sandra Betzina's method it's easy-breezy. Very cute! I really need some white pants too. I know what you mean about 'comfy world of blouses and dresses', I'm so there right now. The pants look great. I love the fact that Burda fit with little to no modification. Incidentally, did you line your pants? I'm making a pair this month, and am torn on the lining thing. A fly front is easy to do, but why would you want to? 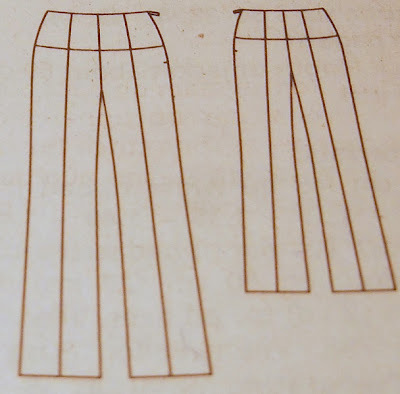 Trousers that are side or back zip flatter a figure much better than a fly front. I only use a fly front on my husband's trousers, mine are all side or back. Reethi - No, I did not line these pants because they are fairly opaque. I will wear skin-colored underwear with these though. The pants look great! And here is my vote of assurance you can do a fly front zipper - they really aren't hard! you can do it!! you can do it!! I gotta cheer lead for you because the more I read your BWOF reviews the less scared I become about trying them again. a very underlooked, inexpensive, but HIGH quality serger are the Juki's. You can get them new and used on ebay all the time and they are good if not better than all the plastic babylock, janomes etc. I have a Babylock as well so I can say that. They are the little workhorses of tailor shops. I have a basic Juki serger and I love it. They make all the sergers for the other brands anyway. Hope that helps. Cindy - Thanks for the Juki recommendation! I will check those out. Your pants look great on you! Now that you stepped out of your confort zone, making a fly front zipper won't be a problem for long! I have faith in your talent! Nice pants. Sometimes JoAnn's have a good deal of sergers. Once you start making a fly front zipper you will prefer them. Sandra Betzina's video on Threads is good, but Debbie Cook's tutorial is really excellent. She is a terrific teacher and her photos are first rate. You can do it. It is really not hard at all. Both Debbie and SB show the fly with a cut on facing. This is easier by far and less bulky. You also do not need to do a fly shield. Women not only don't need it, but it will be one less step. I even like doing fly fronts. Make a sample and you'll feel a lot better about them. Have you looked at a Janome Juno 3434D? I just got mine and I love it!